...otherwise known as my New Favorite Recipe. This recipe appeared in an October 2011 issue of Food & Wine and I'm horrified that I kept it this long without trying it. That means I've lived TWO YEARS without this in my life. It's the culinary equivalent of curling up under a warm blanket on the couch...or soft cashmere mittens on a chilly day...or warm mulled wine shared with a friend. In my version below, I substituted chopped parsley for the celery leaves, adding them to the soup fresh at the last minute. F&W's recipe also doesn't specify which Scotch to use. Adam's a peat-y guy - he loves himself some Laphroaig - but I love my Scotch more toasty and woody so I used one of my personal favorites: Balvenie 12-Year Doublewood. 1. In a medium saucepan, bring the broth to a boil. Keep hot over low heat. 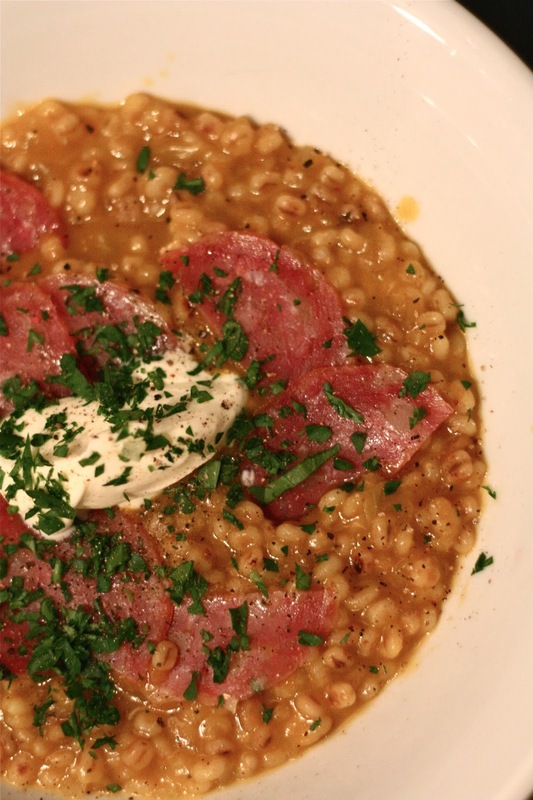 In a large skillet, cook the barley over moderately high heat, tossing, until lightly browned, about 2 minutes. Transfer to a plate to cool. 2. Add vegetable oil to the skillet and add the onion. Cook over moderate heat, stirring a few times, until softened, about 10 minutes. Add the barley and stir well. Add 1 cup of the hot broth and cook over moderate heat, stirring often, until most of the broth has been absorbed. Continue adding more broth, 1 cup at a time (yes, just like risotto), and stirring often between additions. 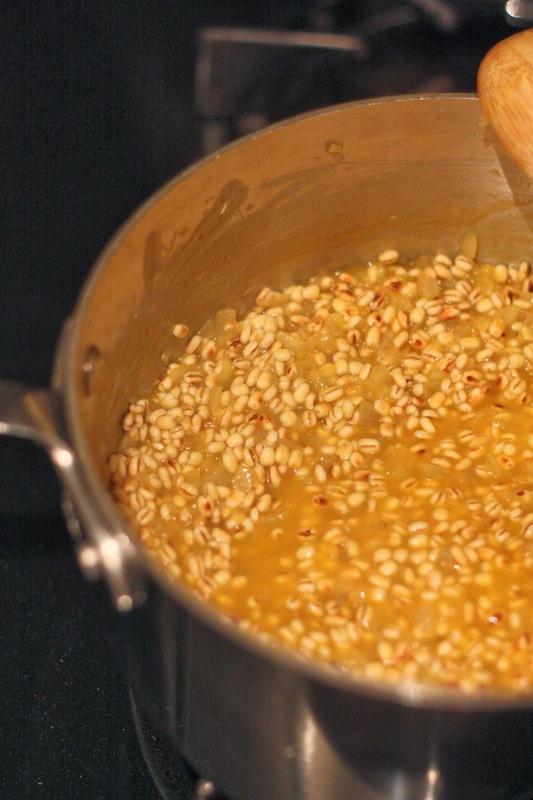 The soup is finished when all of the broth has been added and the barley is just tender, about 25 minutes. Add the Scotch and then stir in the butter. Season with salt and pepper (make sure to taste it!). 3. Ladle the soup into shallow bowls. Top with the salami and dollop of crème fraîche. Garnish with the parsley and serve hot. Can you believe it? That's it. And I really don't think you lose a lot if you leave out the salami and make it vegetarian. I do insist, however, that you keep that dollop of crème fraîche - it's the divine richness that just makes the entire dish. Make this dish ASAP while we're all still mildly entertained by winter's charms. I can guarantee that you'll be flipping off recipes like this one come March...and then you'll have to wait until NEXT YEAR to try this amazing soup! Eat, drink, and ACT NOW. 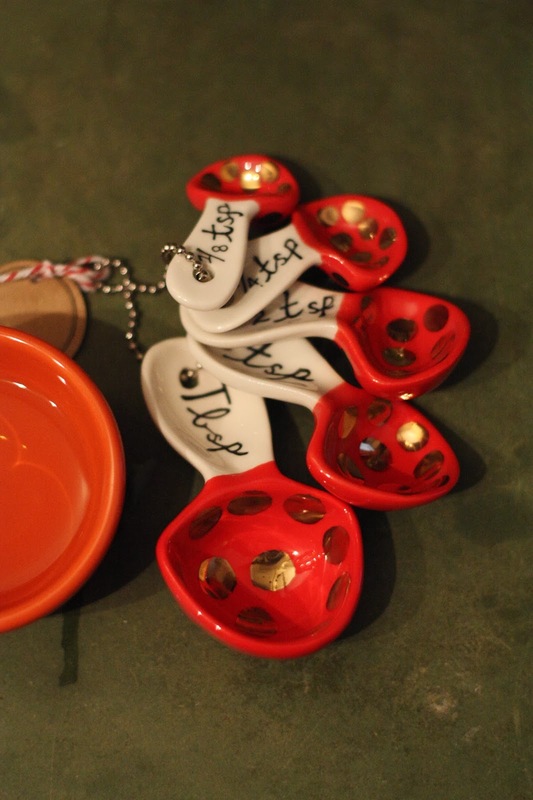 And those measuring spoons are SO CUTE!